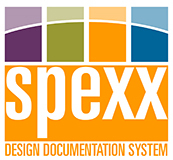 Spexx™ Design Documentation System saves you valuable time and money, ensures accuracy and consistency, eliminates repetitive data entry, and increases your productivity. You want to spend your time designing, not entering and organizing project data. We understand. Spexx was created by designers for designers. Our product simplifies the process of managing project data from start to finish. Our signature product, Spexx Design Documentation System, is a revolutionary, time-saving software solution for the design industry. © 2004- LOJIK Design Systems LLC. All Rights Reserved.